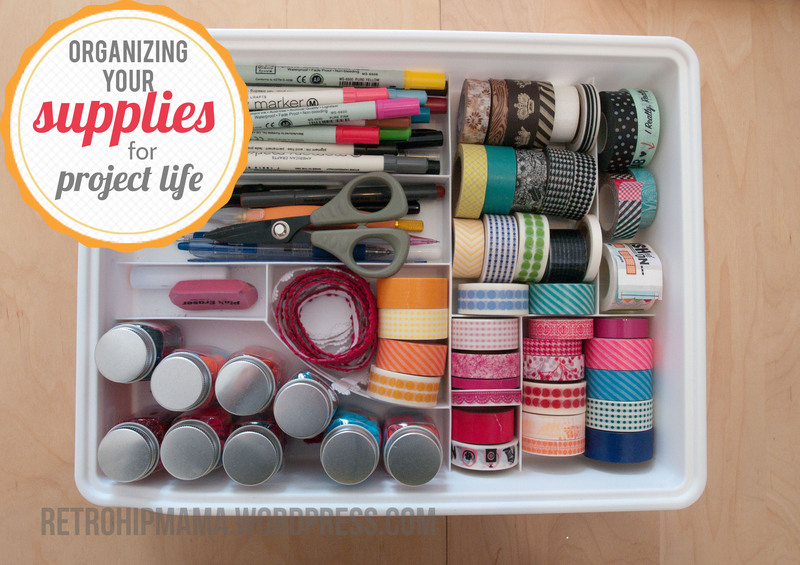 last spring, i made a fabulous organizer to house all of my scrap/project life supplies. you can check out how i made it here. go ahead, check it out, i’ll wait. okay, now that you’re back, here’s how it’s evolved over the year. i’ve invested in more traditional scrapbook supplies than project life brand stuff. i learned that if i buy a kit, i’m sick of the designs in less than half a year. and since paper companies know so many of their customers are using their stuff for project life, nearly everything can be cut into 3×4 or 4×6. genius. and 4×6 stuff. keep in mind that i precut regular 12×12 cardstock as well, not just what the manufacturers design as cutouts. back there are 6×6 paper pads and in front are odd sized scraps. so perfect for the mini pages that are involved with pl. what would an organizer be without a mason jar. this little one is perfect for the tiny embellishments that can get lost easily. on the far right are some smaller sticker pages. in addition to that box, i also keep a crate-o-paper and a tray for my numerous tools. let’s check out the deets, shall we? well, technically it’s paper, stickers, large scraps and page protectors. it’s not “organized” by some people’s standards but because of how often i’m in it and how i know exactly what i have, it’s super easy for me to thumb through the 12×12 sticker pages and 12×12 cardstock. the front has a few file folders that help to corral the larger sticker sheets and smaller scraps and embellishments. i used to organize by color but with all the different patterns and color combos, that became more of a chore to decide which color category it belonged in. so i just keep the cardstock toward the back and the sticker/letter/cutout sheets up front. the larger letter stickers could go into the crate, but i like to keep them separate for my own ocd reasons. and i store them in this cute basket i found at the dollar spot at target. i like to keep them separate because a) they’re fragile. some stickers fall apart and if i’m thumbing through all the other stuff, i’m afraid they’ll get lost or ruined. if i keep them here, i’m only going through them when necessary. since i usually scrap at home and don’t travel much anymore, i felt an open tool caddy was best for me versus the tackle box i used to use. here are the 2 trays i use. seriously, it’s a junk drawer organizer that i found in the kitchen section at target. it was $7 and PERFECT for what i was looking for. the little tray can be placed on top and of course, if it just housed a pair of scissors and paperclips, it could slide back and forth. but i don’t need it for that. i just need it to condense down a bit when i’m not using it. i keep pens horizontal, extra pens, exacto knife, ruler, pencils and erasers in another. o even have my favorite pink eraser and a tube of chapstick. yep, i keep chapstick every.where. i bought these little jars of embellishments from michael’s on clearance a while back. i rarely use them, but they do fit nicely here. just looking at my washi tape stash makes me happy. i need mine to be all out like this and not just tossed in a basket. the smaller tray has some less used tools like stamps and stapler and a circle punch. the baggie back there has a baby wipe in it, come see this post for an extra tip. and that’s it folks. that’s how i stay organized. that’s how i keep from going insane and getting buried in supplies. UPDATE: i posted some videos on my new space and how i’m storing my stuff these days! 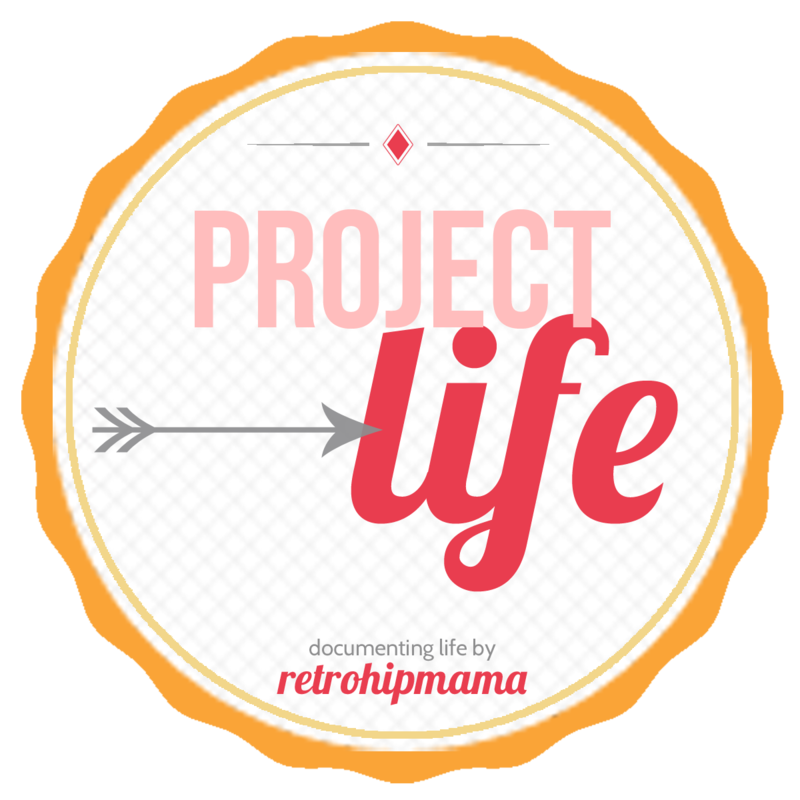 if you missed the first part of this series, go check out how i prepare my photos for the project life process. How fun it was to peek at all these yummy things!! Thanks so much for sharing this awesome orgainzation of yours. It all looks great and helpful. I didn’t find a crate for my paper but I did organize it better. Still going to look for one though because I like this idea a lot. I agree about the bigger letter stickers, they do stick and fall off easily. I do have 2 questions though, one where do you put these when your not using them? In the smaller junk orgaziner are those white things in a row inks?? I didn’t know you used inks? Or are they something else? Thanks again for this, LOVE IT!! Right now, I keep them under the kitchen table, because that’s where I’ve been scrapping. I should be storing everything in my garage scrap area but its a disaster! And yes those are ink pads? I really only use them for the date stamping. 🙂 thanks for the comment love miss dawn! oh and that tape looks so awesome, I have some of the same ones! !